Fire is breaking out in the Texas Panhandle. We aren’t there to witness it up close, first hand. I am hearing reports of serious scorching in an area southeast of Amarillo. I also am hearing reports of firefighters coming from far and wide to assist the assorted Panhandle firefighting units in battling the blazes. 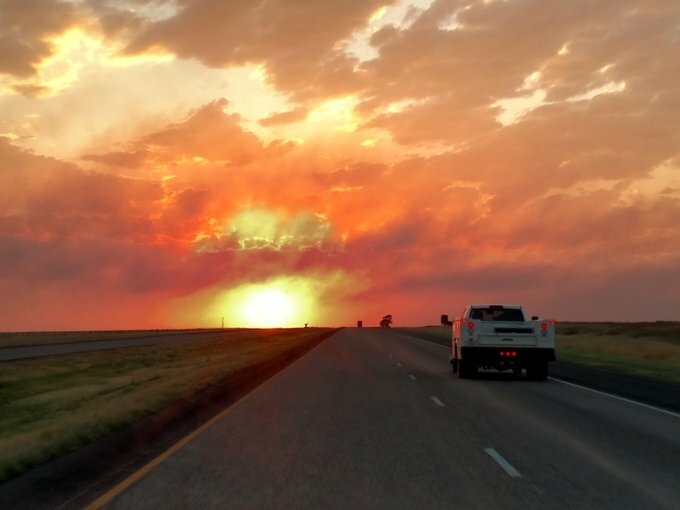 The Mallard Fire has burned 73,000 acres in Armstrong County, creating something called a “pyrocumulus” cloud that developed above the blaze and triggering a severe thunderstorm. It’s time once again to offer word of thanks and eternal gratitude for the selflessness exhibited in times of need by these heroes. So help me, I can’t say it enough. These men and women run toward trouble when it erupts. It’s the same ethic that drives police officers to do the same thing. Man, oh man. If society needs heroes to honor daily, they wear the fire and police uniforms. Many of them are volunteers, which means they get paid next to nothing to risk their lives to protect the rest of us. They are coming from Bexar County in South Texas, or so I’ve heard; let’s see, that’s about 500 miles from the Panhandle. Other reports have firefighters traveling from the Metroplex (Flower Mound, to be precise). I wish them well, safety, and God’s blessing as they do their work on our behalf. Many thanks go to them all. They’re heroes.